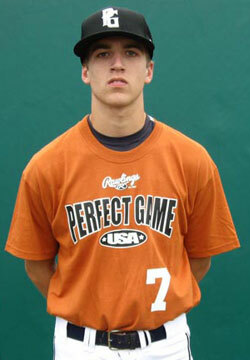 John Tuttle is a 2010 RHP/SS/3B with a 6'1'', 165 lb. frame from Kannapolis, NC who attends A L Brown. Lean athletic build, room to fill out and add strength, short quick arm action on the mound, good armside run and sink on fastball, tight 11 to 5 curveball, locates curveball well, life on all pitches, around the plate, aggressive hitting approach, line-drive swing path, sound hitting fundamentals, barrels the ball up well, smooth infield actions, strong arm, hands and feet work, strong student.